George Asiniero of Dapitan explains to APC high school scholars the work of Dr. Jose Rizal in the town plaza, where the national hero constructed a topographically accurate three-dimensional map of Mindanao. The group then went on to visit many other works of our national hero. For indigenous youth living in upland communities far away from urban centers, going on a “field trip” is a rare opportunity. 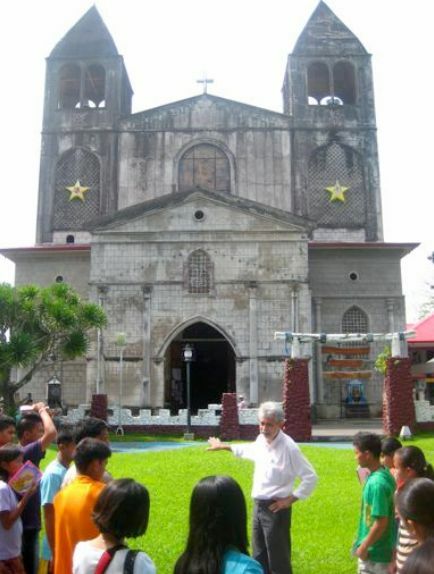 The Pulangiyen youth’s visit to Dapitan City in Zamboanga del Norte, 200 kilometers away from their home in Bukidnon, was a rare learning experience that deepened their understanding of local science and Philippine history, and allowed them to engage with the indigenous Subanen youth of Dapitan. On the first week of April 2011, 21 young Pulangiyen of varying ages went on a Bentela daw Sayuda1 in Dapitan City, which the Philippine national hero Jose Rizal considered his home during four years of exile. In Dapitan, the youth looked into Rizal’s ways of working with people. He was kind and welcoming, which showed his greatness in terms of caring for the people’s needs. They saw a Rizal who used his knowledge, skills and contacts for the benefit of the local community. Rizal was more than just a writer; he was a doctor, a teacher, an engineer, and most importantly, a civil worker. Inspired by Rizal’s efforts in Dapitan, the Pulangiyen youth realized their responsibility for maintaining the community systems in Upper Pulangi. The Pulangiyen youth’s engagement with Subanen youth and young political leaders of Dapitan was a rich source of learning as well. An appreciation of difference in orientation and in some circumstances in life was most evident, coupled with the realization of the importance of respect and openness to new people and new friendships. No matter where they were, all the youth groups (Pulangiyen, Subanen and Dapitan City youth) carry the same challenge of helping build a better society and sustainable environment. 1 Bentela daw Sayuda: A Pulangiyen mechanism of visiting (bentel) and sharing (sayud).